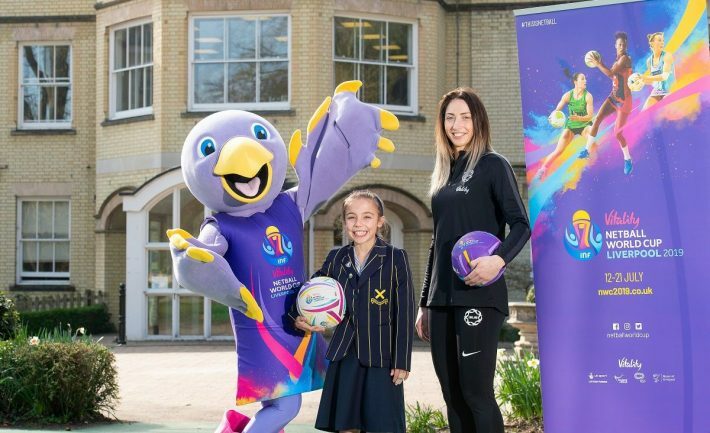 Promising designer Orla Burner, a 10-year-old pupil from St Alban’s High School Prep has been selected as the winner of the Vitality Netball World Cup 2019 ‘Design Our Mascot’ competition. Her prizewinning creation – Jude the Liver Bird – was revealed by Orla, with the help of England netball international Jade Clarke, at a special assembly at the school. Hailing from Harpenden, Hertfordshire the 10-year-old lives with her parents and younger sister. Orla is a passionate netball fan, playing the sport every week, representing her school as part of its under-10 squad and watching her local Vitality Netball Superleague team Saracens Mavericks regularly. There was a huge response to the event’s call out for young designers, with over 120 entries received, but netball superfan Orla’s design for the tournament’s mascot was eventually chosen as the winner by the judging panel which included Jade Clarke. As Liverpool’s M&S Bank Arena welcomes 16 international teams and thousands of spectators this July, the role of the mascot will be to welcome people and bring the event to life. Orla will attend the World Cup’s opening ceremony session on Friday 12 July, where she will be introduced with Jude and see her creation in action, before watching England begin their World Cup campaign against Uganda. Vitality Netball World Cup 2019 ambassador and England Roses most-capped player, Jade Clarke, made a special appearance at the assembly, and said: “It’s great to see so many young people like Orla getting excited about netball, and I’m sure that Jude the Liver Bird will really help bring excitement to the event and prove a popular part of the Vitality Netball World Cup. It’s clear how excited Orla is, and it’s a fantastic opportunity for any young netball fan to be part of a piece of sporting history”. Tickets for netball’s premier international sporting tournament are selling fast, with over 86,000 spectators confirmed so far. Head here for more information: https://www.nwc2019.co.uk/tickets/.